Many of us use OPK’s (Ovulation Predictor Kits) regularly. There are so many brands out there and with that being said, I thought I would give reviews on the ones I use. Most of us are familiar with this huge super-center franchise known as Wal-Mart. (I personally shop there ALL THE TIME!) Although they’re known for their, “Great Values,” sometimes even if it’s inexpensive – there can be some sort of bigger price to pay! And then on the other hand, sometimes you do truly get a great product at a fantastic price. 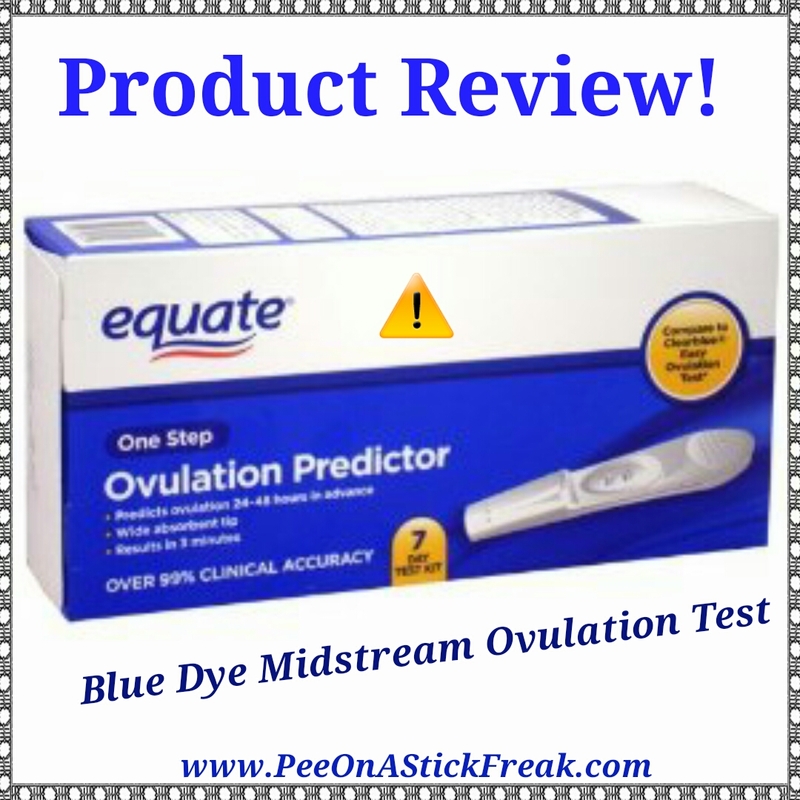 Today I’m going to talk about Wal-Mart’s Brand of OPK – The Equate Midstream Ovulation Test. 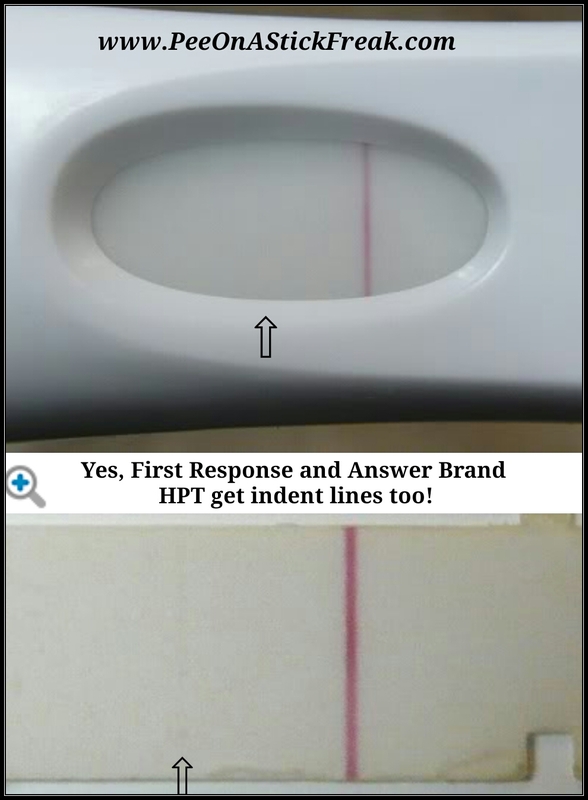 Using an OPK, it’s never uncommon to see two lines though, even after the allotted time-frame in which you have to accurately interpret the results. So in a way, that theory usually won’t apply to these. However, simply being ABLE to accurately interpret the results is just as important! 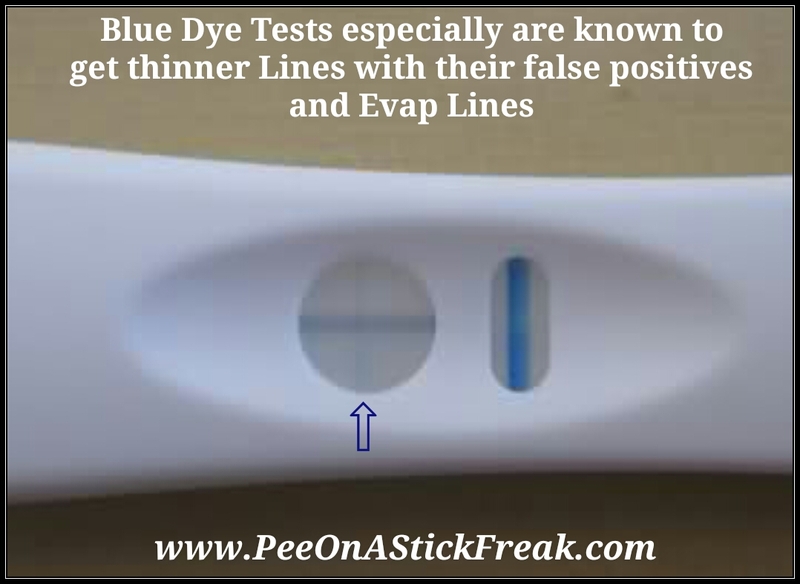 This was my first experience using a Blue Dye OPK and I’ve got to be honest, I wasn’t too impressed with Equates Brand. The opacity of the Lines, made the Tests extremely difficult to read at times. There was never truly a, “Solid,” line persay. It was almost a Light Blue or Turquoise color that was a bit transparent. The first illustration helped to showcase the Tests Dye color, but here’s two ACTUAL Tests from my own collection. Yes they were both positive, but for a newbie or inexperienced person testing with these I could see how they would be a bit confusing to the untrained eye. I would think if they were going to use a Blue Dye rather than a Pink Dye when manufacturing their Tests, they would at least opt to use a Darker Blue that would be easier to read. Not to mention, (after a few minutes) the Dye on the Test starts to fade. The Equate Brand Midstream Ovulation Tests come in a pack of 7 and cost about $12, but honestly I would highly recommend spending a few extra dollars and investing in a better Brand. Even for a Blue Dye Test, they’re at the bottom of the list in my opinion. Here’s my VLOG Review about them, (for a more in-depth look) as I Test them out myself! CLICK HERE TO “LIKE” and “SUBSCRIBE” TO OUR CHANNEL! I give this Product two thumbs down. If you’re wanting to save money, I would say – find a Pink Dye Test instead. Click here for other CUSTOMER REVIEWS! When you’re new to (Charting) it can be a bit confusing sometimes to know exactly WHEN or WHAT to Record on your Fertility Chart as CD (Cycle Day) 1. We used to assume that anytime you had any kind of bleeding, “Well that MUST be the start of our Period!” Yeah, ummmm, no matter how Light, Heavy or even when it happened! I’m sure you’ve heard this from a friend or family member, “You must just be starting Early,” OR, “It must be a LATE Period.” Better yet, no matter how Light it was, maybe they also told you – (or maybe you just assumed as so many of us do) that it was just an EXTREMELY LIGHT Period! Well, as time goes on more and more research is done to help expand our minds and give us some clarity! There are two phases to our Cycle – The Follicular Phase (The time from the first day of our Menstrual Period until Ovulation takes place) and that’s controlled by a Hormone called, “Estrogen.” The next Phase of our cycle is known as The Luteal Phase (The time from Ovulation until either our Period starts or we achieve Pregnancy) and that’s controlled by a Hormone called, “Progesterone,” which is a heat inducing Hormone. If you happen to take your BBT’s (Basal Body Temperatures) throughout your cycle, Estrogen keeps your temps low during the first Phase prior to Ovulation and Progesterone elevates and sustains our higher temps post Ovulation. Most of the time, (either one or two things will happen) – we will notice that our BBT’s have remained High past 13-16 DPO (Days Past Ovulation) and have possibly achieved Pregnancy! Or, our temps will drop back down which is a good indication that we can expect our Period sometime soon. 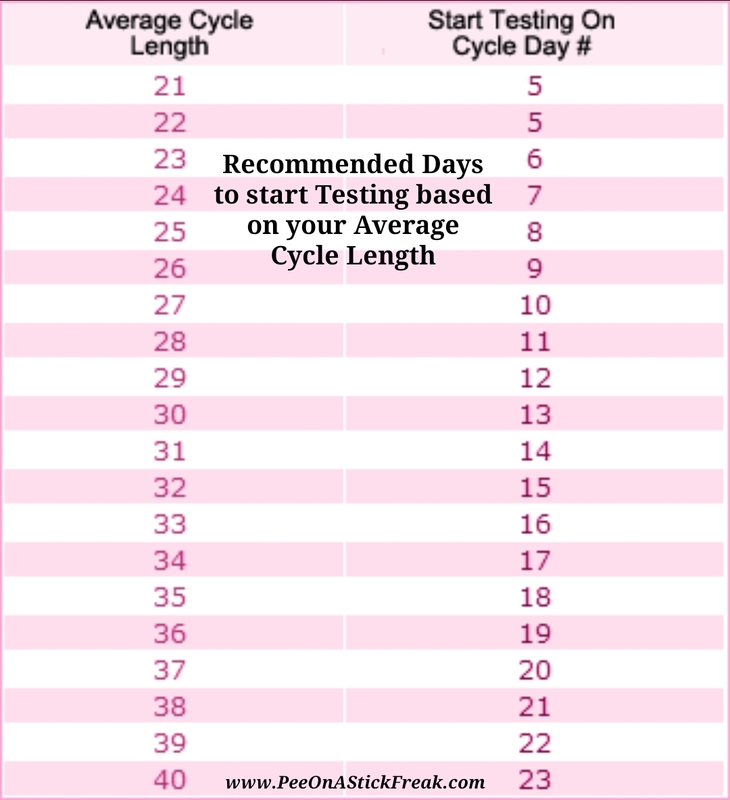 Sometimes though we can experience what is known as, “Mid-Cycle Spotting,” on or around Ovulation. That is not uncommon! Usually (if you’re also keeping track of your Cervical Fluid or Cervical Mucus) you may notice a bit of Fluid that resembles raw Egg Whites. If you happen to see a bit of Pink, Red, or even Brown tinged EWCM (Egg White Cervical Mucus) that is considered to be amongst the most fertile, and is caused Sometimes by a bit of spotting due to the Mature Egg breaking through the Egg Follicle. 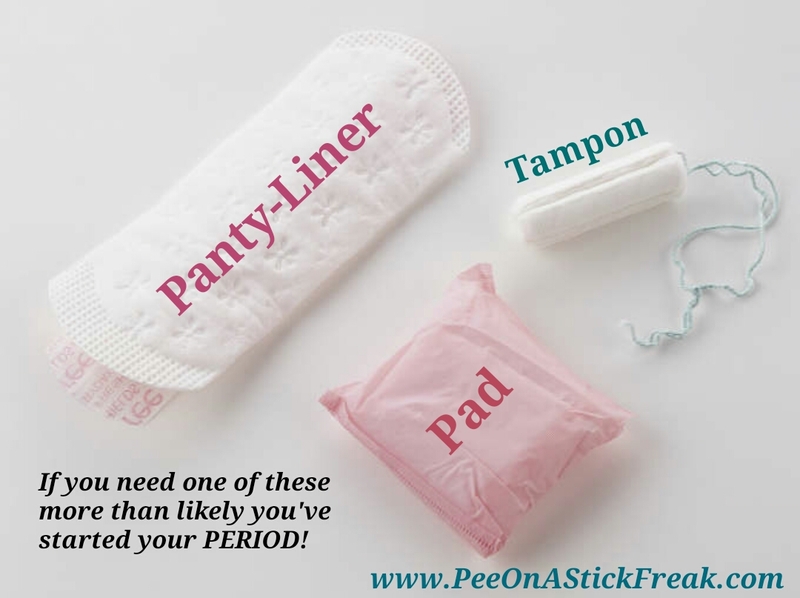 Cycle Day 1 (again) is defined as your first day of actual Bright RED or Dark RED Flo that requires a Pad or a Tampon! If you’re actively TTC (Trying To Conceive) and you have a higher Temperature above your coverline – (and you notice a bit of spotting) Don’t lose hope just yet! There may be a possibility that it’s simply Implantation Spotting. If you’re new to Charting, (or tracking your Period) even if you’re NOT actively TTC – Charting is still a great way to pinpoint your Period each cycle and can also indicate whether or not you should possibly Test for Pregnancy. So you’ve decided to start using OPK’s to help you determine when your BEST chance at Conception is? That’s great! You’re now on your way to maximizing your chances of successfully getting Pregnant. If you haven’t started charting, I highly recommend it! Although testing with OPK’s (Ovulation Predictor Kits) is a great way to gain some much-needed insight into your Fertility Window – It only Does just that! You’ll need to follow-up with 3 days of sustained higher BBT’s (Basal Body Temperatures) to confirm that Ovulation has in fact taken place. Usually a great indicator (or second fertility sign) of WHEN to start testing with a OPK, is when you start to notice Fertile Cervical Fluid. Usually after Menstruation you’ll notice a bit of Scant, dry, or Sticky CM (Cervical Mucus) if any at all – followed by Creamy or Lotion-Like, and then as Estrogen starts to influence your hormones your CM will begin to thin out! You may start to notice a bit of a watery sensation and that usually will lead to the most fertile type of CM which is categorized as EWCM (Egg White Cervical Mucus) which the name sort of speaks for itself. If you’re not familiar with it, crack open a raw Egg and feel the consistency of the Egg whites! It should be slippery, clear and stretch 1-2 inches between your thumb and your index finger. Sometimes it can also be tinged with Pink, red Blood, or even brown! (That is considered to be amongst the most fertile) so if you happen to notice that type of CM along with a Cervical Position that’s High, Soft and Open – Now’s definitely the time to Test with a OPK! Here’s a Chart that can give you a Good idea as to when (based off of your average cycles) would be a Good time to start! There are 3 types of Tests you can use – “Midstream,” which is very Common at drugstores, “Cassettes,” which are also very Common, “Digitals,” and then lastly our Internet Cheapies, (also known as) “Test Strips,” which is what we are talking about today. They’re by far less expensive simply because you’re not paying for the fancy container they come in. Now with the most effective Test date being determined with your other secondary fertility signs – It’s also important to understand how to PREPARE for testing! So what is a LH Surge? Well, LH tends to flow through our bodies at all times. 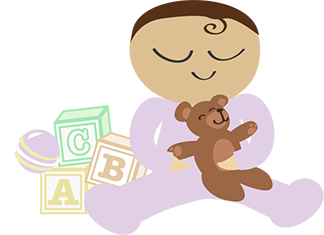 Just a few days prior to Ovulation the LH Hormone starts to increase to a higher concentration (thus as we call the “Surge”) and that higher concentration of LH can then be measured by a OPK. Typically speaking there are different brands of OPK’s that can detect different levels of the Hormone so to speak. A normal, healthy female would probably opt to use a OPK that detected 30-40 mI/U only because we have the Hormone constantly running through our system and would not want to yield a False Positive result using a lower sensitivity test. (In some cases though, you may need a lower sensitivity Test just depending on what YOUR “normal” concentration is that’s running through your body during non-peak times) – We on average, typically have anywhere from 1-20 mI/U prior to our Surge. You can find Tests that are 10-25 mI/U, 30-40 mI/U (which is considered average) and then the lower sensitivity Tests that can run up to even a 100 mI/U! (Again, I highly recommend NOT purchasing those Tests simply because according to some Consumer Studies it’s usually next to impossible to have a LH Surge that High in concentration!) You’ll more than likely yield nothing but Negative Results. Once you’ve established the best brand, day, and time to start taking your Tests – a Good question most have is, “How Do I Read Them?” Here’s a few illustrations that may help you learn how to interpret the results. This can be a bit confusing if you’re unfamiliar with how they work. This claims if there’s 2 Lines, it’s positive. Don’t be fooled though! Regardless of what kind of OPK’s you opt to use, essentially they all work the same way. 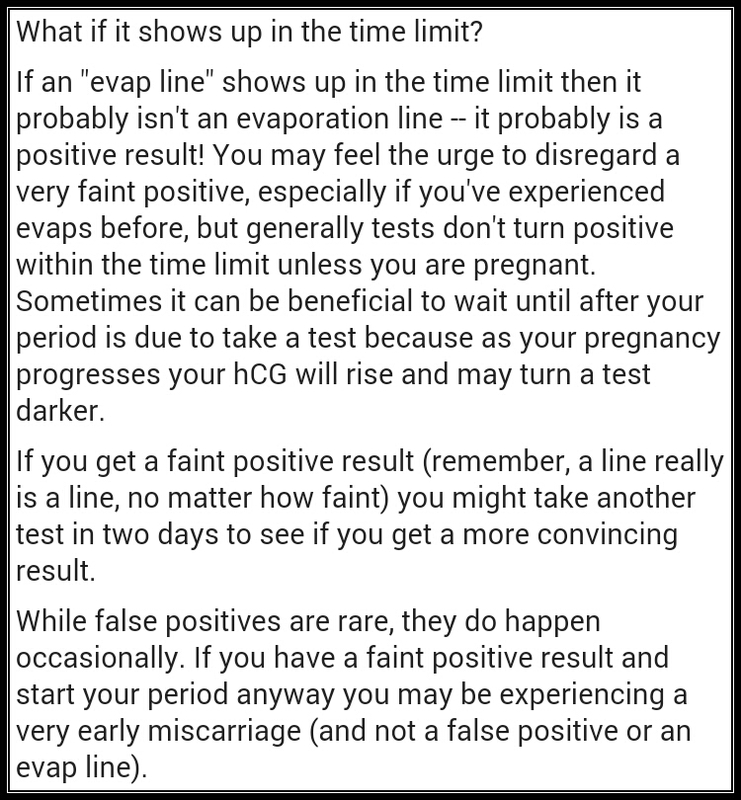 A TRUE Positive Result, (unlike a Pregnancy Test) is when the Test Line is EQUAL TO or DARKER THAN the Control Line. 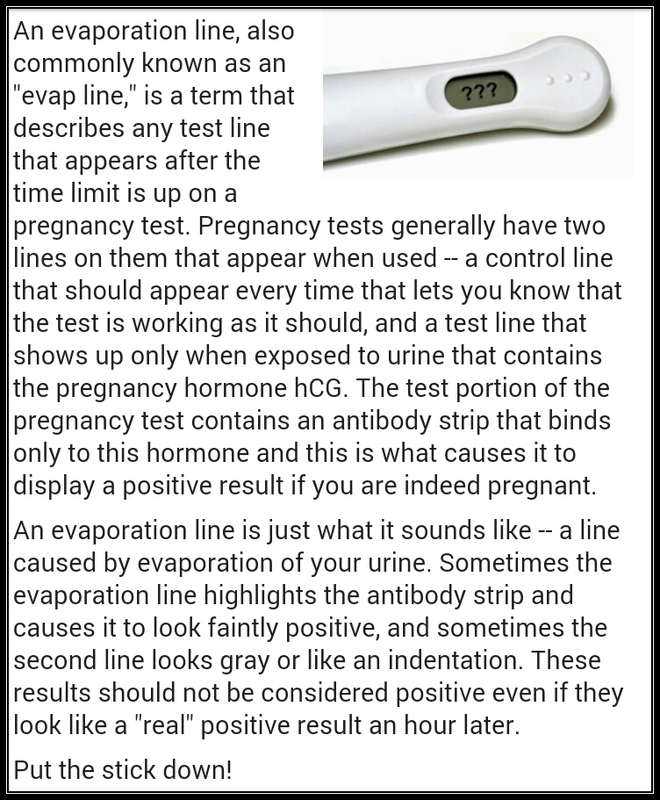 Some also opt to use a Digital Ovulation Test, to confirm the Midstream Test or the Test Strips Positive looking Results! You can’t go wrong with a digital. There’s absolutely no guessing involved although they are a bit more expensive. But if you happen to get a Blue Dye Test, you’ll understand WHY it may be a Good idea to FOLLOW up with a digital since they can be a bit harder to interpret. (You’ll have to check out my OPK reviews if you want some further insight with that subject). Name Brand OPK’s that you can find in your local drugstore can be a bit costly. 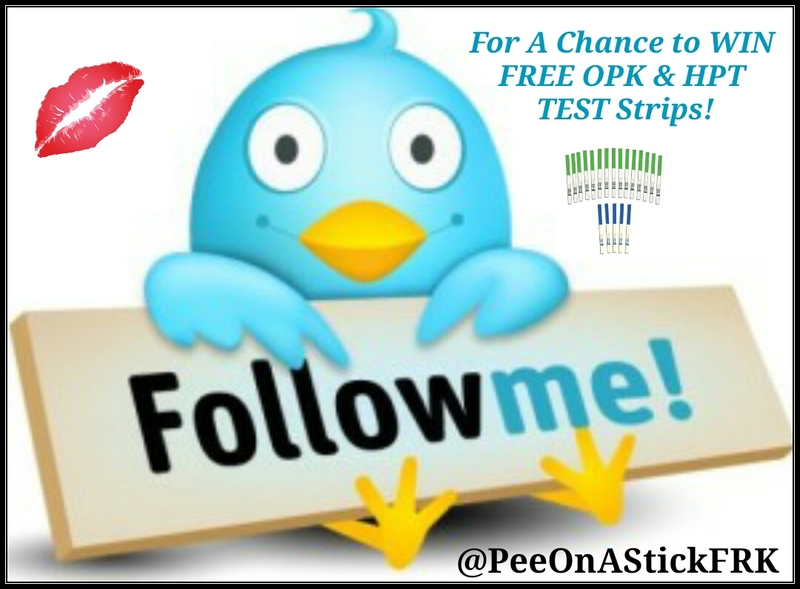 Some opt to use the Internet Cheapies known as “Test Strips” Because essentially you can buy a Big bundle of OPK’s and HPT’s for a small fraction of the price. If you like to Test frequently it can add up, and I’ve found over the years that it’s a much more cost-effective way to gain more insight into your Fertile Window each cycle. Which (I might add) you can’t beat FREE! 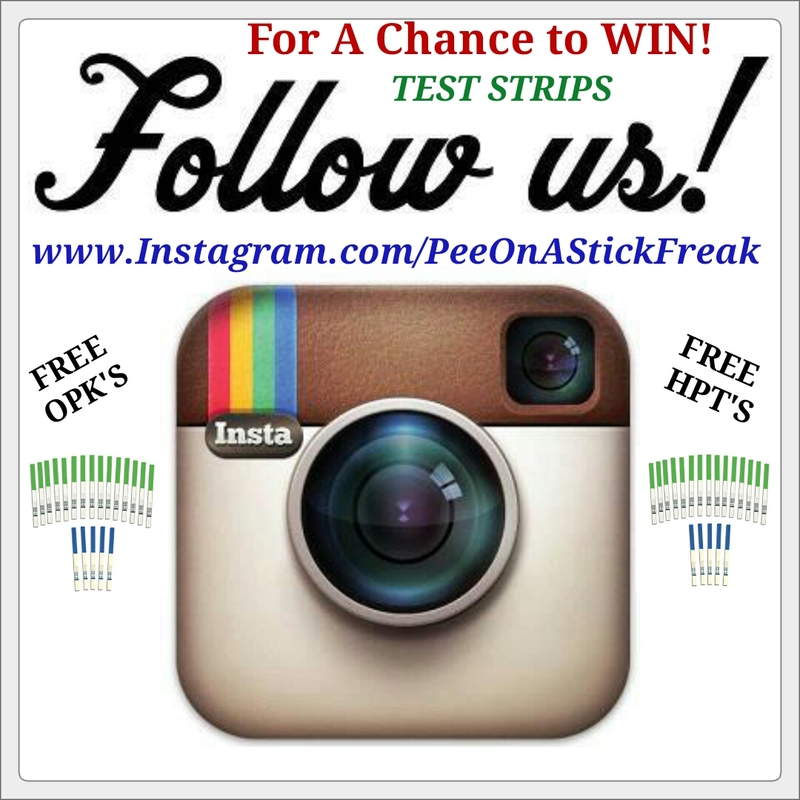 You have a great chance of winning a bundle of OPK’s and HPT Strips (on me) simply by “Liking” our Facebook Page – (PeeOnAStickFreak) “Following” our Twitter (@PeeOnAStickFRK) and lastly our Instagram (PeeOnAStickFreak) – The more referrals you have, the greater your odds are! All you have to do is have your friends/family members comment on each account stating WHO refered them! SIMPLE! I will be picking winners randomly and the ultimate prize is the bundle along with a $25 Gift Certificate to a restaurant of your Choice! GOOD LUCK! 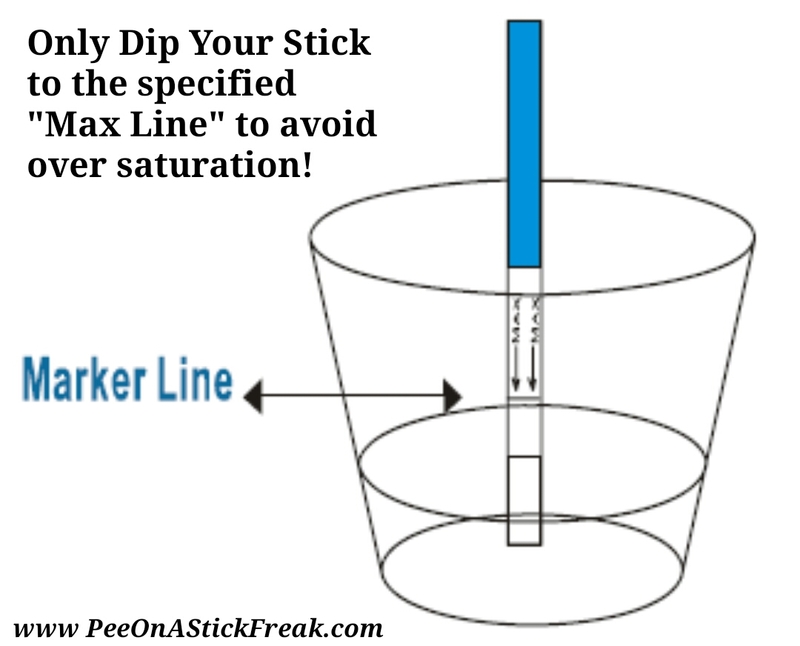 Getting back to business (Ha Ha) when taking your Test, you’ll want to make sure that your urine doesn’t sit out for any length of time, and you also hold the Dip stick in your (CONCENTRATED) urine for at least the specified amount of time on the instructions. Otherwise I highly recommend dipping it for a full 5-10 seconds! Only Because you want to avoid under-saturating your Test and yielding a lighter Test line, and in some cases a False Positive Result! (Check out my OPK Experiments, Videos, and of course my Informational Tidbits) to my conclusions with those results! Also, I highly recommend waiting the full 5-10 mins before interpreting the results. You’ve got to keep in mind that OPK’s work a bit differently than your average HPT. 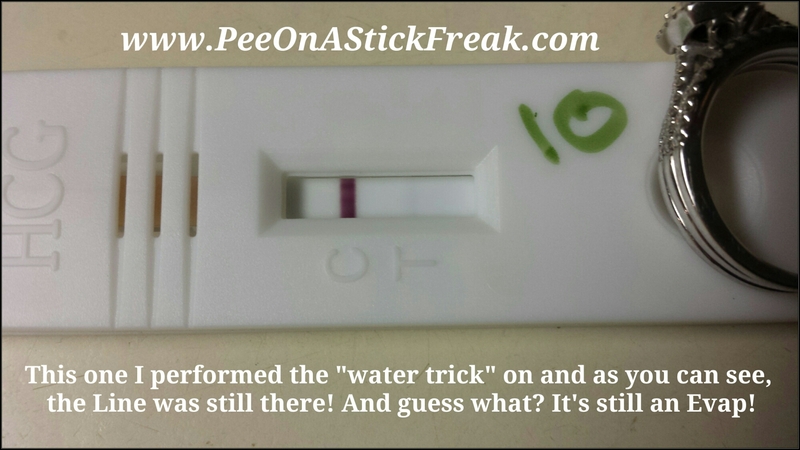 (Something else I just wanted to add which I also mentioned in my video) is when you purchase a pack of Midstream Tests, Cassettes or even Test Strips – you have to judge each Test individually! The reason I’m saying this is because different Tests have different amounts of Dye in them. You may have taken a Test yesterday (that came in the same pack) that had a very Dark CONTROL Line, whereas today’s Test has a very Faint one. No worries! Your Test Line (if positive) will reflect how light or dark your CONTROL line is. So if the CONTROL line is very light, as long as your Test line matches that or is a bit Darker than it’s considered positive! Same thing if the line is lighter, that would be considered Negative! So with that being said, (Yes I know it’s a ton of information to absorb if you’re not familiar with these things) after a few cycles, you’ll get more familiar with it the same as you would with all of your other secondary fertility signs! For a more, in-depth demonstration I made this lovely video showing you just how simple this can be but most of all BENEFICIAL! When you yield your first true positive result, don’t forget to DTD! (Do The Deed) also known as Baby Dancing! PLEASE CLICK TO “LIKE” and “SUBSCRIBE” TO OUR CHANNEL! Can the TEMPERATURE of URINE effect the result of a OPK? As I was doing a Video Experiment yesterday, it occurred to me that there may be a possibility that the actual Temperature of Urine itself, could possibly effect the outcome of a OPK! As I was looking at the Tests (with the naked eye vs camera) they both yielded positive results BUT the T (Test) Line wasn’t as dark as it normally is on the Test used with CONCENTRATED Urine. I would have expected that with the Test used with DILUTED Urine. Of course going through my emails I actually came across one that had sparked my same interest and theory about THE TEMPERATURE OF URINE! Could that have had en effect on the result? PLEASE CLICK TO “LIKE” the (Part 1) VIDEO! PLEASE CLICK TO “LIKE” the (Part 2) VIDEO and to also “SUBSCRIBE” TO OUR CHANNEL! 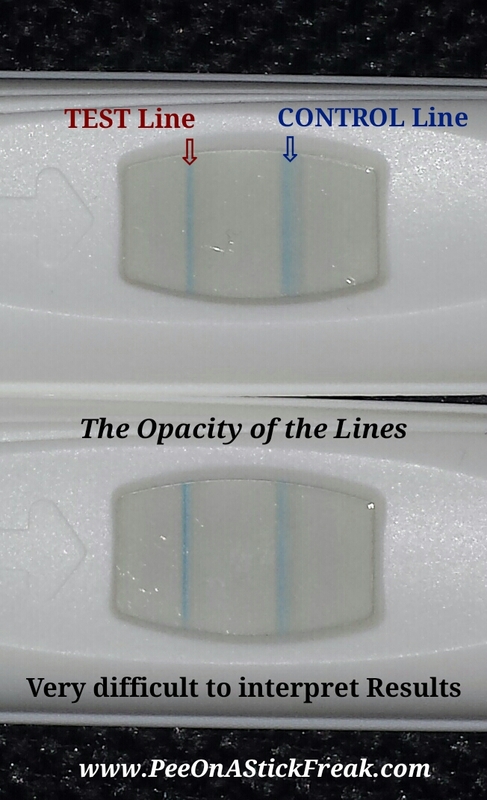 Can the CONCENTRATION of Urine effect the opacity of a Test Line on a OPK?! I’ve had a few inquiries (Yes my fellow TTC’ers please keep the experiment ideas coming!) 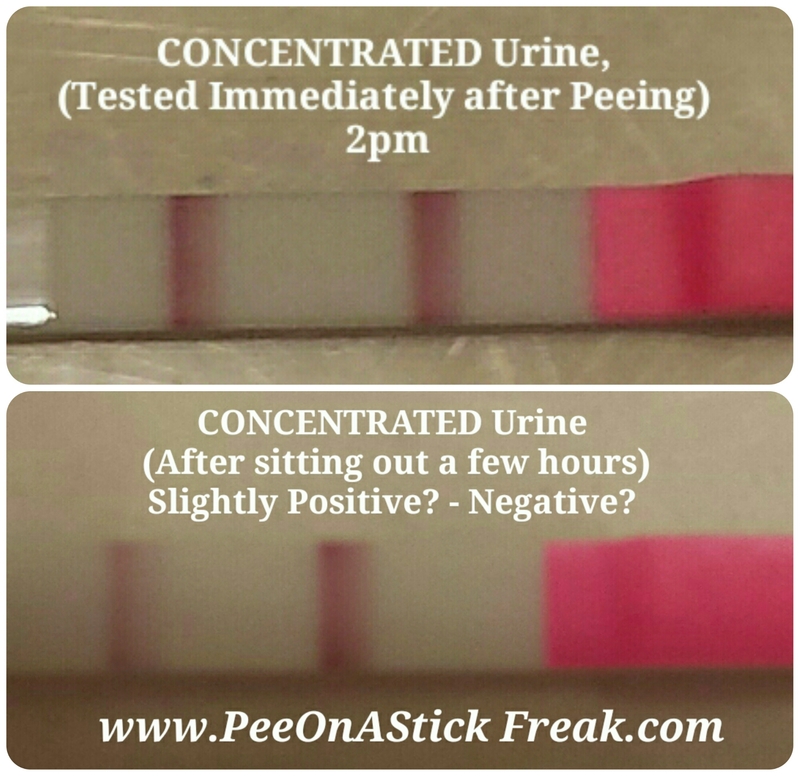 about whether or not the actual CONCENTRATION of urine, can effect the lightness or darkness of a Test Line? So, (seeing as how I’m not currently Pregnant) I thought, WHY NOT TEST WITH AN OPK? (Ovulation Predictor Kit) – For some odd reason during my last cycle I had an extremely higher level of LH (Luteinizing Hormone) and had tested positive the night before! PLEASE CLICK ON THIS TO “LIKE” and “SUBSCRIBE” TO OUR CHANNEL! 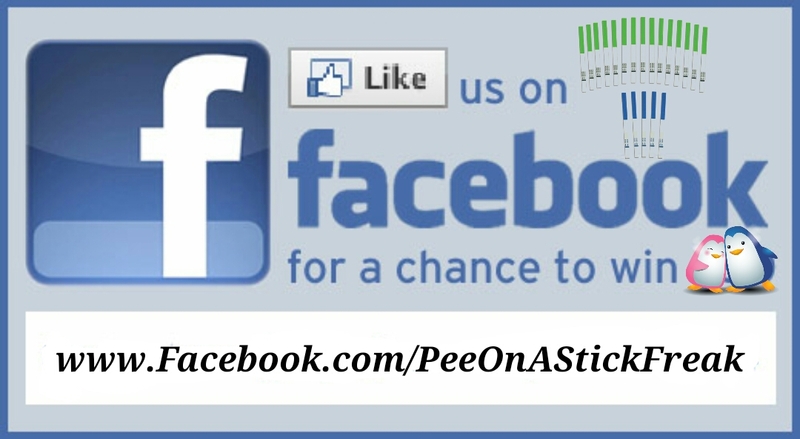 Well I got my Internet Cheapies in the mail last night and decided to Pee-On-A-Stick (Ha Ha) and yep it came out positive. So, today I made a video COMPARISON with my Pink Dye Test Strip vs my Blue Dye Midstream Test (Equate Brand) to see if I would yield the same results with both, and to see which Brand was better? PLEASE CLICK HERE TO “LIKE” this (Part 1) VIDEO! PLEASE CLICK HERE TO “LIKE” the (Part 2) VIDEO and to “SUBSCRIBE” TO OUR CHANNEL!